On Monday(April 2nd) Blake Lively attended the 'A Quiet Place' New York premiere at the AMC Lowes Lincoln Square theater. 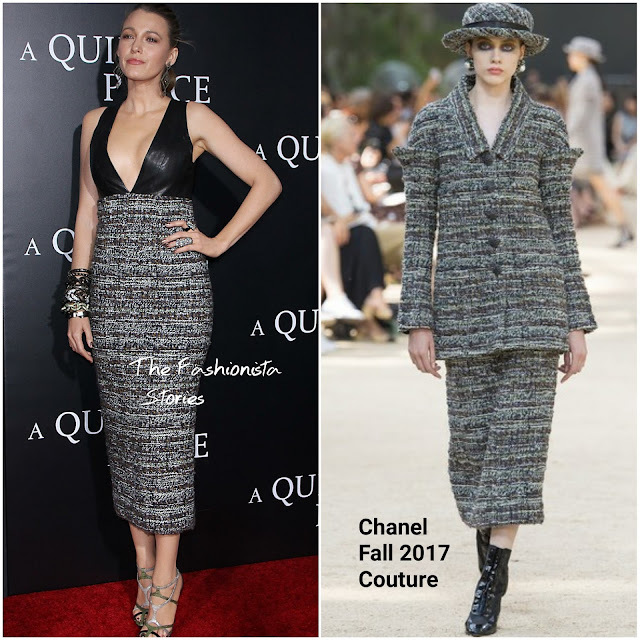 Turning to one of her favorite brands, she wore a CHANEL FALL 2017 COUTURE calf length dress which featured a leather, deep v-neck top and a tweed skirt. I am usually a fan of Blake's red carpet looks but not this one. The pieces that she chooses are always great but together, this one is off. The high-waist skirt with that neckline and BALENCIAGA sandals, does not work together. LORRAINE SCHWARTZ & OFIRA jewelry and a ponytail finished up her look. What do you thunk of Blake's look?